Download Seminar Report and PPT on the topic Industry 4.0, the fourth industrial revolution. It is one of the latest trends amongst industrial companies. It would be a great opportunity for engineering students to study and learn the new inventions of technology revolution as well as to create the business mind for a better future. Industry 4.0 is a great topic for a seminar. 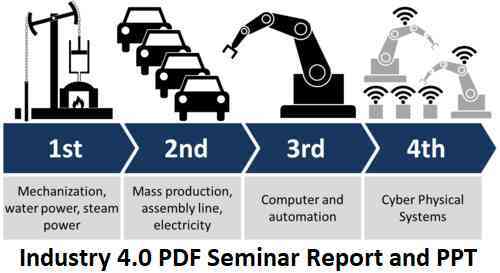 Here we have uploaded three best PDF for seminar reports and PPT which will help you to understand the concept, potential and major challenges of Industry 4.0. Industry 4.0 (the fourth industrial revolution) encapsulates future industry development trends to achieve more intelligent manufacturing processes, including reliance on cyber-physical systems, the Internet of things, cloud computing and cognitive computing which leads to implementation and operation of smart factories. The concept of Industry 4.0 promises many positive changes to today’s manufacturing, including mass customization, flexible production, increased production speed, higher product quality, decreased error rates, optimized efficiency, data-driven decision-making, better customer proximity, new value creation methods and improved work life. The first PDF report is titled as Industry 4.0: A Review on Industrial Automation and Robotic submitted by Mohd Aiman Kamarul Bahrin, Mohd Fauzi Othman, Nor Hayati Nor Azli, Muhamad Farihin Talib from Centre for Artificial Intelligence and Robotic, Universiti Teknologi Malaysia, Kuala Lumpur, Malaysia. This paper presents a review of the advances in robotics and automation technology in achieving industry 4.0. Hopefully, from this report, engineering students would be exposed to new inventions of technology revolution as well as create the business mind for a better future. Second seminar report which is an analytical article by Kadri-Liis Kusmin from School of Digital Technologies, Tallinn University, Estonia. This paper discusses the Industry 4.0 which is a combination of several novel technological advancements such as information and communication technology, cyber-physical systems, network communications, big data and cloud computing, modelling, virtualization and simulation, improved tools for human-computer interaction and cooperation. This paper will greatly help you in understanding the concepts of 4th industrial revolution and create seminar report on Industry 4.0. The Third Seminar report is titled as Industry 4.0 Concept: Background and Overview by Andreja Rojko ECPE European Center for Power Electronics e.V., Nuremberg, Germany. The aim of this seminar report is to present and facilitate an understanding of Industry 4.0 concepts, its drivers, enablers, goals and limitations. The Industry 4.0 seminar report also discussed if Industry 4.0 is really a disruptive concept or simply a natural incremental development of industrial production systems.